When I tell people I have bipolar disorder and/or BPD (I speak less about BPD because of the deep stigma associated with it), they usually have some idea about what it means. They might know it’s something to do with prolonged or intense mood changes, or they might know it affects sleep patterns a great deal. Others know a little more because they suffer from some symptoms of mental illness themeselves. They will know that when I’m having ‘a bit of a dip’ I am struggling to function. Maybe they think I cry a lot or that my depression manifests itself through listless, unmoving rumination on events that have made me feel bad. And they wouldn’t be wrong exactly. It’s just not a complete picture. I’ve been having a bit of a bumpy time of it over the last few weeks and each time I thought it was passing I seemed to slip again. I’ve mentioned before that I attempted suicide when I was 13 years old, by overdosing on paracetamol. I’ve written about the panic I feel when I realise I’m in a place where I might not be able to work – which of course translates into ‘might not get paid, might not be able to pay rent, might have nowhere to go, might end up homeless.’ Then there’s the dread and panic involved with seeking help. I might get told my only option is to go to A & E, where previously I have been patronised, dismissed and treated with contempt. Yes, contempt would be the right word. They might tell me I need to go on medication, which does not solve anything for me personally. The fact of the matter is, I have been in therapy for a long time and likely will be for a good while yet. Because I have been through some terrible things, I have had to learn how to cope with the aftermath, and for me that’s through talking therapy. It helps me process the ways in which my past has affected me and it teaches me new skills to cope that have turned my life around. It brought me to a place where I truly believed that my disorders could be something from which I can recover. But it’s been years since I’ve been able to access that kind of care through the NHS. I see my current therapist on a private basis and even though the fee is extremely reasonable I am still not getting the care I need. I have to work part-time because that’s all I can manage. My rent has risen after a house move, and it takes almost half my wage each month. After debt repayments and travel costs I barely have enough to eat, never mind enough for therapy. Admitting this makes me feel ashamed for being poor. I am more than aware of the deep lack of support available to me now. So I don’t underestimate the importance of following a strict regime of mental health maintenance. Every morning, I do the morning pages exercise. I practice mindfulness techniques as much as I can throughout the day. I do intense exercise through kickboxing and jiujitsu training three times a week (I cannot tell you enough how much this helps). I try to finish the day with a guided meditation to help me relax and fall asleep. This is what I do just to get me through the day, when I’m feeling ‘normal’. When I’m not doing so well, I will visit the loo at work to let out a few tears and practice mindfulness a little more intensely, and I will write affirmations over and over to change my mindset. I also keep a mood diary that I can take to my therapist so we can explore whether anything has triggered a dip. 70% of the time, these techniques will work. But then there are the times when they don’t. My diagnoses have helped me get to know how my symptoms play out and what my triggers are, although this is still very much a work in progress considering I only got diagnosed at the end of 2011. If I follow this strict regime, I can still expect to have about two serious mood dips in a year. I’m confident (today) that with the right support, these will decrease and perhaps disappear altogether. I’m fortunate enough not to lose a job with each dip anymore. So a few months ago, when I was feeling good – in control, on top of things and generally happy – I went to my GP and said, “I need your help to make a crisis plan of action for when I next have a dip.” I wanted to be prepared. I was making an effort to fight; I was going to continue working and making a living like a normal person, no matter what. I was told, “Sorry, but mental health services are a mess. You will only be treated when you are in an acute phase. But if you feel like you’re starting get bad again, come to me – I’m quite confident that I can handle most things.” Ok. I kept it in mind. At the beginning of my dip last week, I went to straight to my GP before I started feeling really bad. I knew I wouldn’t be able to see the doctor with whom I’d had that conversation at such short notice, but by this point I knew I was in danger of entering an acute phase anyway and I wanted to be referred, either to a psychiatrist or a psychologist. What I got was an appointment with their Brief Intervention Team. For the 25th November. And the numbers for a bunch of crisis lines. Yesterday, I called the practice again, and was told that the doctor who had given me her assurances is away at the moment, but that I can get a senior doctor to call me back. I know how this will play out – it’s A&E for me at this point. I left work early, because I can no longer perform the, ‘I’m fine, I’m just having a bit of dip’ pretence. This was not a new plan. It’s been on my mind since the breakdown that led to my diagnoses. 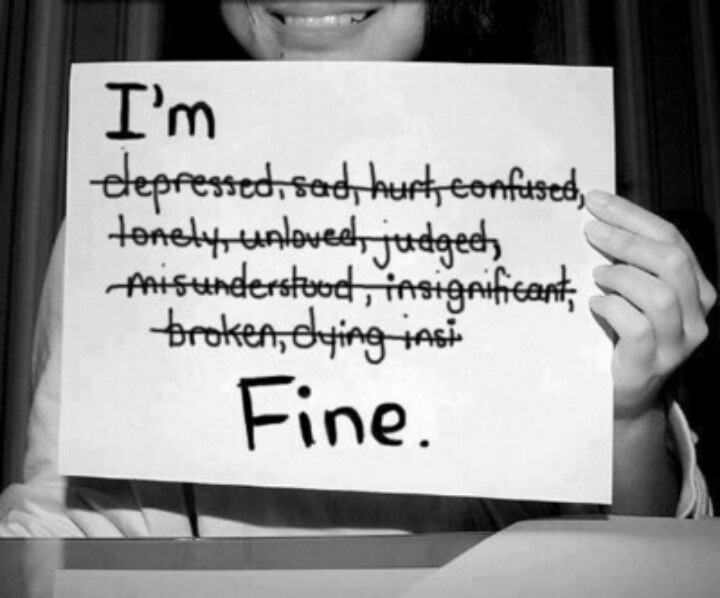 So what do I tell people when they ask me how I am? 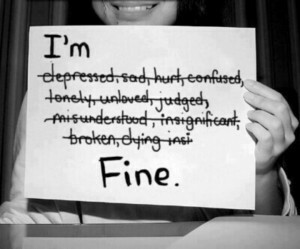 I say, “I’m fine” or “I’m just having a bit of a dip”. Because I do not need platitudes or reminders to think positively, or compliments on my ability to manage and pull through, as much as I appreciate and value that in my times of wellness. But what I have is a mental illness. Illness does not respond to logic. Illness does not respond to ‘pulling yourself together’. And illness certainly doesn’t respond to avoidance or denial of the issue. If you really want to be there for someone who is suffering from symptoms of mental illness, consider your ability to do so carefully. If your own emotional capacity is depleted, you cannot help. If you don’t have time to listen, you cannot help. If you cannot bear to hear words of utter despair without pressuring your friend into ‘staying positive’ when they do not really feel it, you cannot help. And you know what? That’s okay! We are all human and we are each dealing with our own challenges. Set your boundaries and be at peace. And crucially, remember that they must feel comfortable opening up to you. The worst thing you can do to a friend with mental illness is make them reassure you in their time of need. If you cannot help, accept that and leave them be. If, after considering all of this carefully, you still feel like you have the capacity to support someone with mental illness, go to them, as quickly as possible. Give them your time, your ears and your open arms. This entry was posted in Happiness, Mental and Emotional Wellbeing, Mindfulness by Tartan Tantrum. Bookmark the permalink. After my initial injury I could not bond for a good few years, so drifted from random sexual encounter to random sexual encounter. I lost 2 great lasses, and it was all a bit pants really. Seemed exciting at the time, but you just ended up feeling hollow inside in the end. Thankfully my emotions started working again after about 3-4 years, so that helped. And I’m very fortunate I knew Tai Chi from my youth, as that probably saved my live. Yeah, 4 years of depression & anxiety. 2 suicide attempts, and anxiety attacks so severe I would collapse in the street and need an ambulance. Even though I’m a 6ft ex Mediaeval ReEnactor type. Bloody embarrassing, but when that dopamine flows too much there is little you can do. It doesn’t matter how beefy you are you end up on the floor. I find the biggest barrier to dating is the ol’ stigma mixed with The Poverty. You can’t afford to buy someone a drinkie, and you can’t afford to have them co-habit with you. I can’t work normal hours, as I have 3 major injuries that bounce off of each other. I get a lot done, sure; but it’s from home and on an ad-hoc salary. Which is pretty pants cash in reality. Stone broke, and the bills keep coming. I make my own booze, and repair most of my kit myself ( I was an engineer before my injuries ) but even so. It’s just not easy. So people like us remain stressed, and that slows our recovery. Who ever though that one up needs sacking… *grumble*. Yeah, you’re not the only one seeing no personal touch or TLC in NHS Services. I’m pleased to say we are fixing this in Croydon, but it’s a slow thing to get in. The CCG are still assigning the cash, let’s put it that way. I had to get Counselling privately as I was declared delusional for talking about being a survivor of Domestic Violence. The NHS was utterly clueless back then. They’re getting a lot better at it these days thankfully. New Horizons ( Gordon Brown, 2010 ) was a huge help for us Patient & Carer Campaigners. I’d say the prognosis is good for my patch, but I know Croydon is getting pretty advanced compared to other patches. Once they realised that people go mad due to stress/ trauma, and drugs aren’t always to blame, we were really able to move the agenda forward. I will be sharing this. What a powerful blog post. It is a terrible illness to live with. As a family member to someone who lives with bi polar and as someone who myself suffers depression I know only too well how awful it is and how the ‘I’m fine’ response is all you can feel capable of for fear of others platitudes. I hope I do help my family member. It’s been and still is at times a very tough road. But he has got better since his diagnosis in 2004. Unfortunately the stigma & understanding of others hasn’t improved much and I low he has had exactly same response from NHS services. It’s only dealt with at crisis stage which can often be too late.